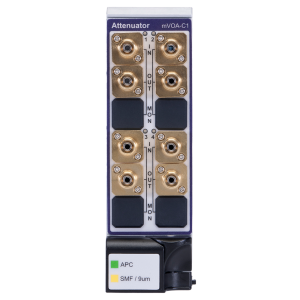 The Multiple Application Platform (MAP) Variable Optical Attenuator (mVOA-C1) is optimized for the industry-leading VIAVI MAP-200 platform. Based on the previous-generation Multiple Application Platform (MAP), the MAP-200 is the first photonic layer lab and manufacturing platform that is LAN Extensions for Instrumentation (LXI)-compliant by conforming to the required physical attributes, Ethernet connectivity, and interchangeable virtual instrument (IVI) drivers. The MAP-200 platform is optimized for density and maximum configurability to meet specific application requirements in the smallest possible foot print.